Jeffrey Goldberg contributed an interesting article (Among the Settlers) to last week’s New Yorker, about Israel’s religious settlers in the Occupied Palestinian Territories. Although dealing primarily with the extremist settlers, Goldberg’s article also gave some column space to the views of extremist Palestinians, and to a representative from the Israeli and Palestinian moderates; no doubt to be seen to be Fair and Balanced. Goldberg was clearly more sympathetic to his “moderate” interviewees (Dror Etkes of Peace Now, and Michael Tarazi of the PLO’s Negotiations Affairs Dept), and makes a point of mentioning how he argued vehemently when his hosts among the settlers made racist and dehumanizing remarks about the Palestinians they live among. We were in his apartment, in Gaza City, which was filled with his grandchildren when I arrived. They provided him with protection. Rantisi never picked up a ringing telephone; he always had one of the children answer. (The Israeli security services have managed to kill at least one prominent terrorist with an exploding telephone.) At the end of the interview, a telephone rang on a table next to my chair. No children were available to answer it, and Rantisi asked me to pick up the receiver. I declined. What melodrama. And what utter rubbish. Read that paragraph again, and ask yourself if it really makes sense. Rantisi thinks his apartment’s phone might blow up, so he gets someone else to answer it, but stays in the same room with them, where he’s going to get blown up alongside them if the phone really does turn out to be booby trapped? Really? I don’t doubt that Rantisi had other people answer his phone for him, for reasons I'll explain below. But Goldberg’s assumption that this was because Rantisi was happy to let an innocent bystander – even his own grandchild – be blown up in his place, is ill-informed and just plain wrong. And the fact that Goldberg should slip such an interpretation so casually into his work says that – for all his protestations of tolerance - he is a lot closer to than he thinks to accepting the ugly, stereotypical view of Palestinians that he condemns in the settlers. Let me explain for Mr. Goldberg why Rantisi (and Hamas leaders in general) don’t answer their own phones. It’s true, as Goldberg points out, that “The Israeli security services have managed to kill at least one prominent terrorist with an exploding telephone”. But I doubt very much that Rantisi thought that Shin Bet operatives had snuck into his apartment and wired up his fixed, home telephone with an explosive device without anybody noticing what they were doing it. The Israelis have in fact killed four “prominent terrorists” with exploding telephones, but not in any way that would make Rantisi worry about the safety of his home phone: the difficulty of getting undisturbed access inside a suspect’s home for long enough to rig up an inconspicuous telephone booby trap makes that method unfeasible as a means of targeted assassination. Israel’s use of booby-trapped phones for assassinations is quite different from what Goldberg implies. In the most famous instance, that of "The Engineer" Yehia Ayyash, a Palestinian collaborator supplied Ayyash's stolen cellphone to the Israelis who packed it with explosives, then had the collaborator return it inconspicuously to Ayyash, whose head was blown off when Israeli agents, observing remotely, detonated the phone. 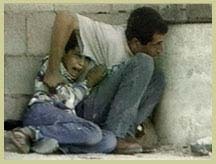 Additionally, booby-trapped public telephones, remotely exploded, have been used to kill Iyad Mahmoud Nayef Hardan (5 Apr 2001), Osama Jawabra (25 Jun 2001) and Muhammad Ishtawi 'Abayat (13 Oct 2002) during the current intifada. What do those four instances have in common? They all involve telephones (stolen cell phone, public call box) that the Israelis had easy, uninterrupted access to; the kind of access that they would not have in the case of a home or office phone. In fact, of the almost 180 extra-judicial executions carried out during the intifada, precisely zero have involved the use of booby-trapped home or office phones. So Rantisi's reluctance to answer his home phone probably wasn't based on the fear that it was going to blow up in his hand, as Goldberg assumes. If Hamas’ leaders don’t answer their own phones, it is far more likely because of the precedent set in the killings of former Hamas leaders Jamal Mansour and Jamal Saleem, who were the targets of an extra-judicial killing in their office building in Nablus on 31 July 2001. As part of that operation, the Israelis called Mansour on his office phone. As soon as the (Israeli) caller confirmed that he was speaking to Mansour, the Apache helicopter that was hovering above the building fired its missiles at his office. Mansour and Saleem were killed instantly, along with six bystanders, including two brothers aged 8 and 10, who were playing in the street outside. That is how office and home phones can be used in assassinations, and that is the reason why Abdelaziz Rantisi knew better than to pick up his phone when it rang during Goldberg’s visit. Any Hamas leader who knew how the Israelis had got to Mansour and Saleem would know better than to identify himself on the phone without first knowing that he is speaking to a legitimate caller. Having a family member answer the phone is simply a means of screening out hostile callers without letting them know whether their potential target is home; not a cynical ploy to have your kids blown up in your stead by an exploding handset. Apparently, Goldberg doesn’t really know much about targeted killings beyond his one fact: “The Israeli security services have managed to kill at least one prominent terrorist with an exploding telephone”. But that doesn’t stop him coming up with a rationale to explain Rantisi’s behavior. After all, who needs facts, when you can draw on 50 years of conventional wisdom about the Arabs who don’t love their children (or in this case grandchildren) like normal people do, and think nothing of sending them out to die? 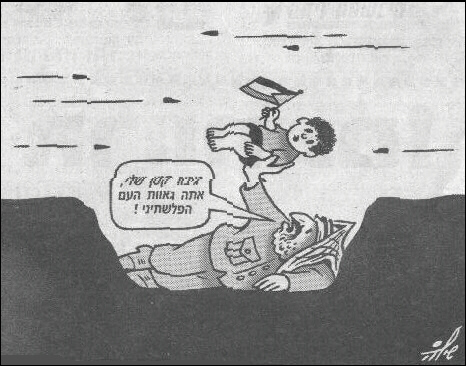 For years, Israeli apologists have been spouting racist and dehumanizing slogans to explain why Israel is just forced to kill so many Palestinian children, from as far back as Golda Meir and her Peace will come when the Arabs will love their children more than they hate us (Washington, 1957), and When peace comes we will perhaps in time be able to forgive the Arabs for killing our sons, but it will be harder for us to forgive them for having forced us to kill their sons (London, 1969). And of course the rationalizing away of Palestinian childrens’ deaths has become a major industry during the current intifada, as Israel tries to justify the deaths of 577 Palestinian children at the hands of the IDF in the last four years. Israel has tried to deflect blame onto its victims from the very first days of the intifada, when French TV filmed 12-year-old Mohammed al-Durrah, being “killed by Israeli security forces live gunfire to the abdomen and chest” (B’Tselem), and the Israeli media saw fit to explain away his death like this; to the killing in Rafah of Ahmed Mughayer, 13, and his 16-year-old sister Asma, 16, who the IDF insists were killed by a Palestinian bomb rather than an Israeli sniper, even though the only injuries they suffered were a single gunshot through the head; to as recently as 19 May 2004, when the IDF fired tank shells and helicopter missiles at a protest march in Tel Sultan (killing 4 children), which Ha’aretz (yes “liberal”, “pro-peace”, “progressive” Ha’aretz) explained away by complaining the Palestinians have convinced the world yet again, this time with pictures, that the IDF is deliberately targeting civilians! The only rule to this game is that no child’s killing must be ever be Israel’s fault: even when we shoot their kids, they make us do it, because they don't love their children. And that’s the current of racist claptrap that Goldberg draws upon here to explain what he sees in Rantisi. A Palestinian has his grandchild answer the phone? Well, obviously he’s putting the child in harm’s way to save himself and make the Israelis look bad, just like in the cases of those other 577 kids those cunning Palestinians made us kill! Why look for an explanation based on the precedents of earlier Israeli assassinations, when you can effortlessly find all the explanation you need in your own prejudices? So excuse me if I’m not impressed that Jeff Goldberg doesn’t like other people using racial slurs against Arabs. He might not use the terms himself, but he’ll happily draw upon the racist stereotypes that the terms express; and I’m not sure that gives him any grounds for moral superiority over the unapologetic racist who doesn’t pretend to be anything other than what he is. Jeffrey Goldberg is the pet of David Remnick who, when he became the New Yorker's editor, made it into a Zionist publication (Sy Hersh notwithstanding). Typically Goldberg focuses on Arab terrorists, never once noting that there are fundamentalist murderers in Israel as well.